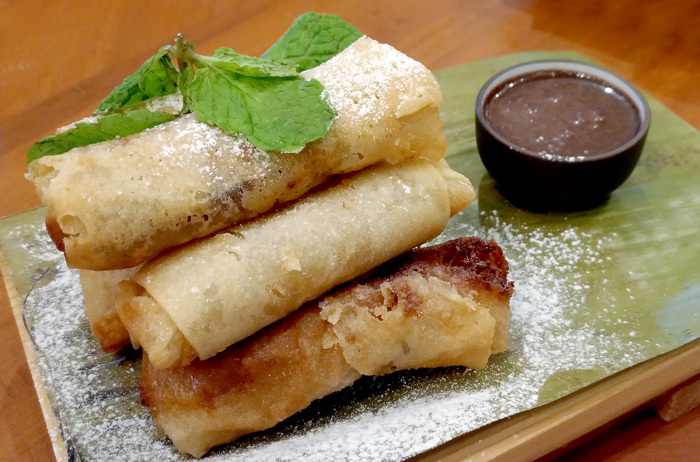 A lot of our Filipino family dinner traditions have become a thing of the past because of the changing times. 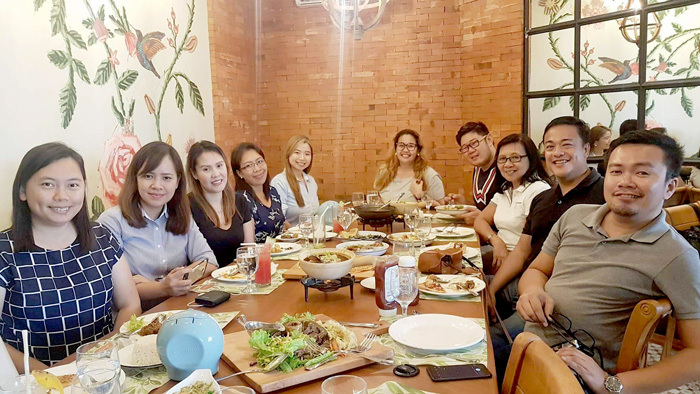 In today’s Filipino households where both parents go to work and children have frenzied schedules with school, homework and many other extracurricular activities, finding time cooking at home and gather at the table seems to be unworkable. 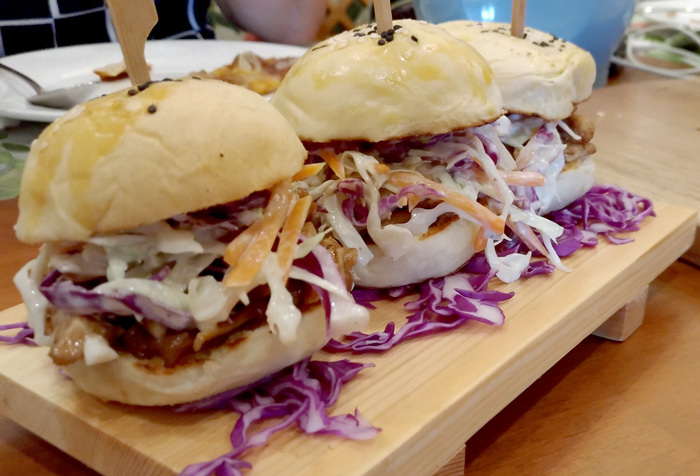 But with the latest addition of Sundays to Davao food scene, it’s awesome to say, we’ve just found another delicious way to bridge this gap to bring family dinner traditions back. This time with a modern yet familiar fare. 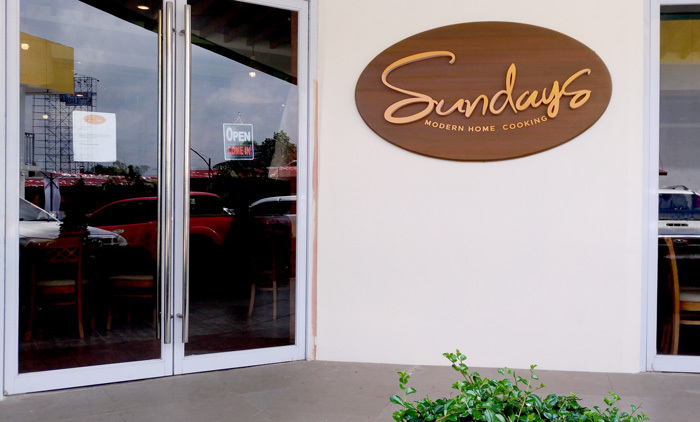 Sundays food concept caters to home flavour sensibilities of Dabawenyos. It’s a place to find that familiar taste of home you’ve missed too long. Many of what’s on their menu are traditional family recipe that has been pass down from one generation to the next. And guess what? I was one lucky earthling I got to sample many of the delectable time-honoured dishes and I’m sharing them with you on this blogpost. Sundays is conveniently located at the ground level of GoHotels at Phoenix Megastation in Lanang, Davao City so parking is no problem. The interior boasts a happy and comfortable feeling with snug seats and tables that are amply spaced. 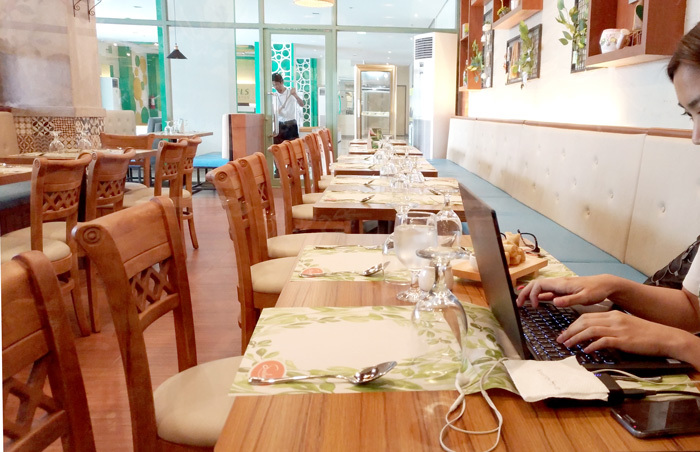 The relaxing atmosphere is a perfect family food spot and a hushed space for those who want to come eat and get some work done. They also have a separate enclosed room that can accommodate up to 15 people for those who wish to have meals in private. 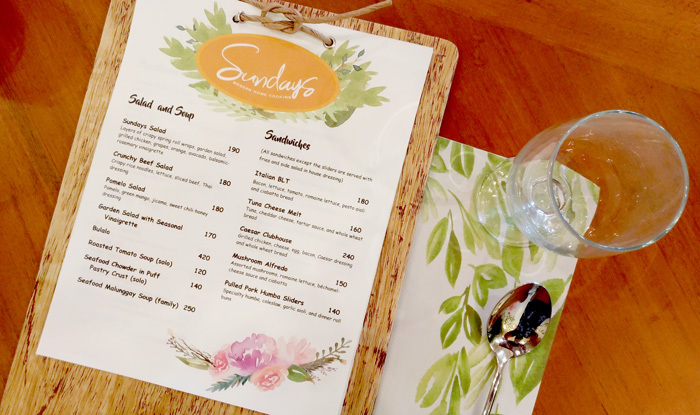 The shabby chic concept of the menu list, the plates, the furniture, the decors add up to the cosy ambiance of Sundays. 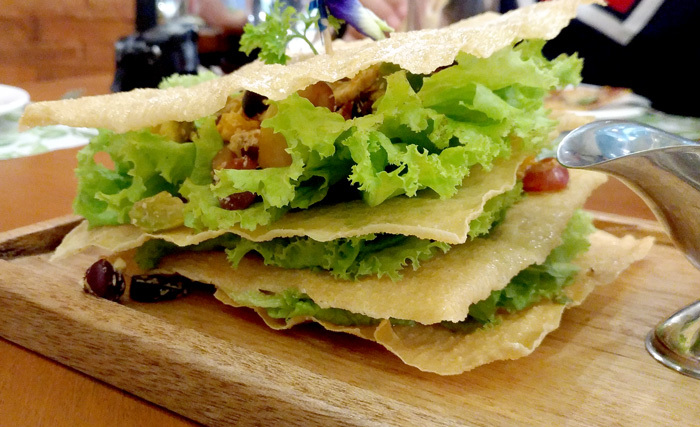 Offering fresh and healthy food fare, which every family need, is one of the food aspirations of Sundays. 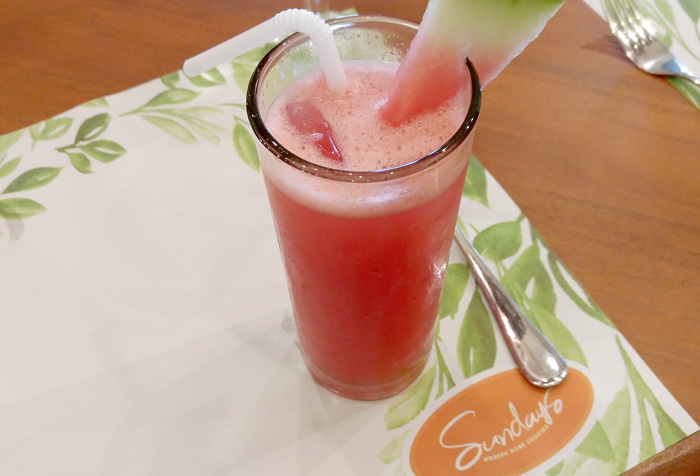 The menu offers a good list of fresh fruit juices and shakes you can choose and enjoy from. And now join me as we delve into this gastronomic journey tasting the flavours of modern home at Sundays. First on the table; Sundays' Salad. 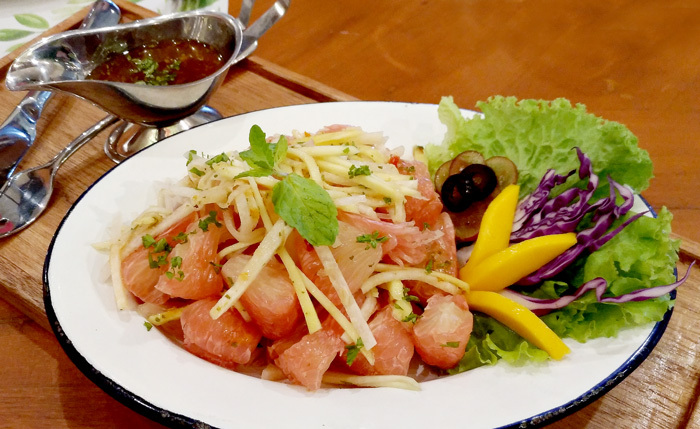 One signature Dabawenyo starter is also on the menu - the Pomelo Salad. It’s a platter of Davao sweet pomelo, green mango, jicama and garnished with garden greens in chilli-honey dressing. PhP180. I love the idea that a number of their dishes are plated on ‘Sartin’ wares. Does that look and feel familiar to you? 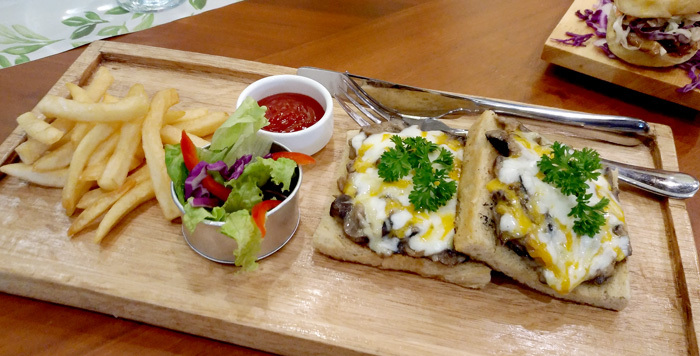 That sure prompts food memories of your childhood, at least for generation x and y.
Sundays also offer a good list of Pizza flavours – Pepperoni and Mushroom, Four Cheese, Hawaiian, Mushroom Margherita, Bolognese and the ones I love, Shrimp and Chorizo pizza. Guaranteed your kids will enjoy it, this mom did so. So good! 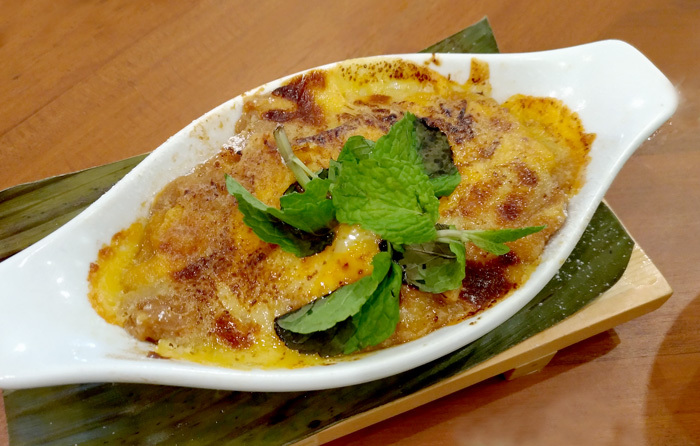 One of the must-pick on the appetizer list is the Malunggay Dip. Well, there’s always a first-time and this is my first. It’s a blend of finely minced malunggay, cheese, some magical herbs and spices with crostini and tortilla chips to go along with it. Who would have thought this combo will make a one-of-a-kind dip? It’s seriously healthy and tasty. PhP180. 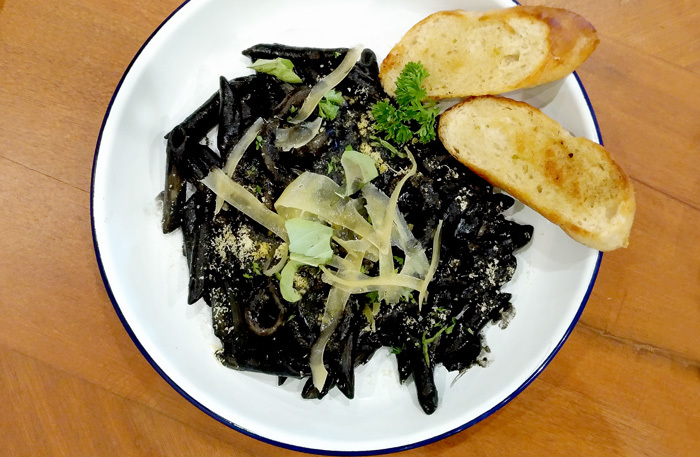 One of the must-tries at Sundays is Penne Nero. It's an appetizing blend of squid ink sauce, squid meat, Italian sausage and generous helpings of fresh seasonings. Highly recommended! PhP200. You don’t have to go far to find one of the best-tasting seafood curries in town, Sundays have it. 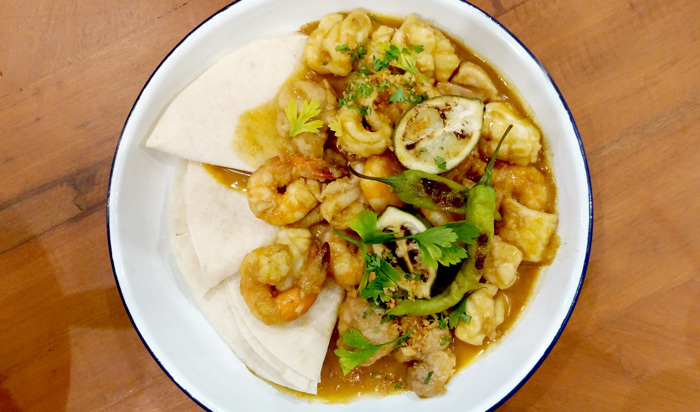 On this platter is a flavourful blend of fresh seafood in aromatic curry sauce. Each serving comes with grilled tortilla, perfect pair off. If you’re on a low-carb diet, this one’s a good choice. PhP380. When this platter came to the table, caught everyone saying, OMG! What’s not to love about these thin and crispy pork belly strips? 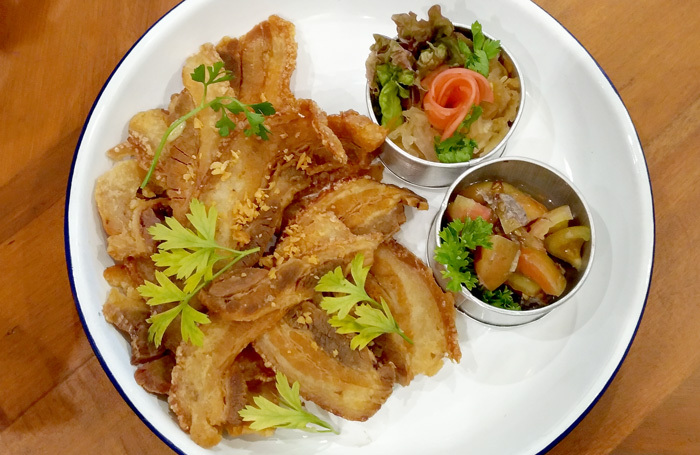 In the know, Sundays’ serve all-day breakfast, so drop everything and go for this Bacon Liempo strips instead. Life is too short to not indulge, so go for it! You’ll be coming back for more, trust me! PhP320. 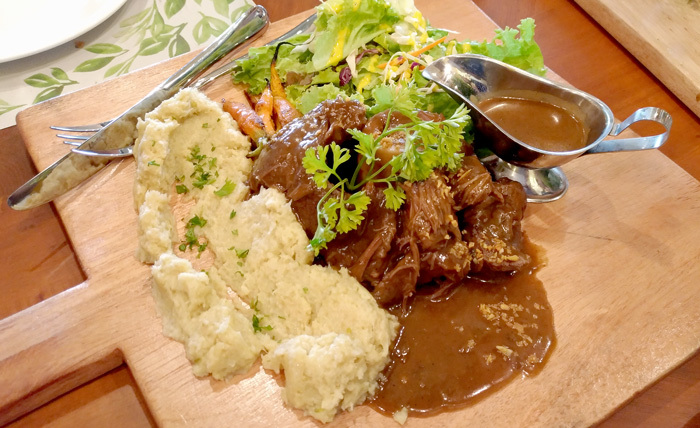 Another Sundays signature dish you shouldn’t miss trying is the Ox Tail Stew. This oriental tasting dish is stewed for hours in rich tomato sauce and flavourful spices. Its serve sitting on a little table top stove so it keeps warm all through-out meal time. 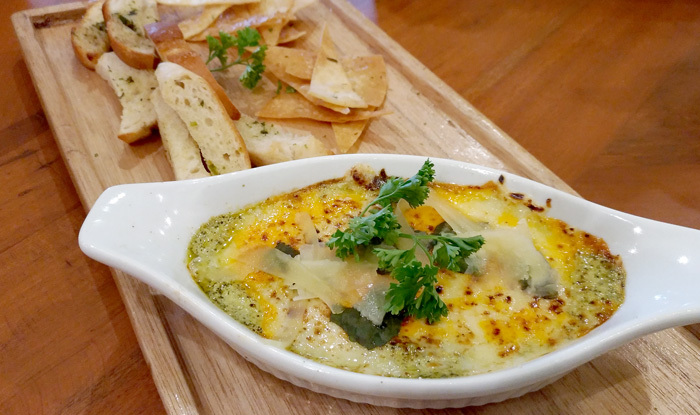 This serves 3-5 persons for PhP630. Sundays’ version is a family recipe, handed down by their grandfather. 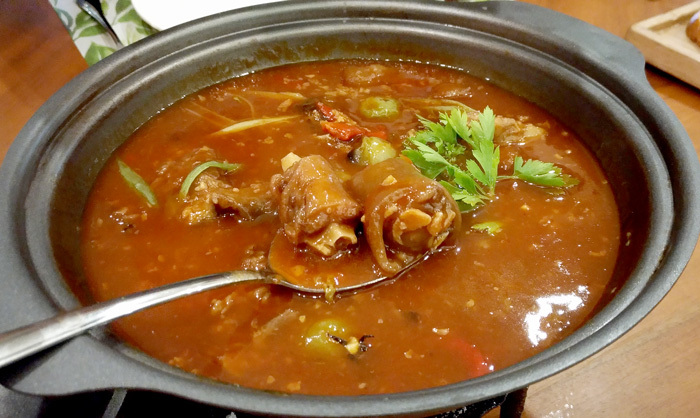 A true traditional Chinese Humba that’s braised for long so the pork meat comes so tender it fall to bits. The boiled egg made the sauce even richer and so full of flavour. 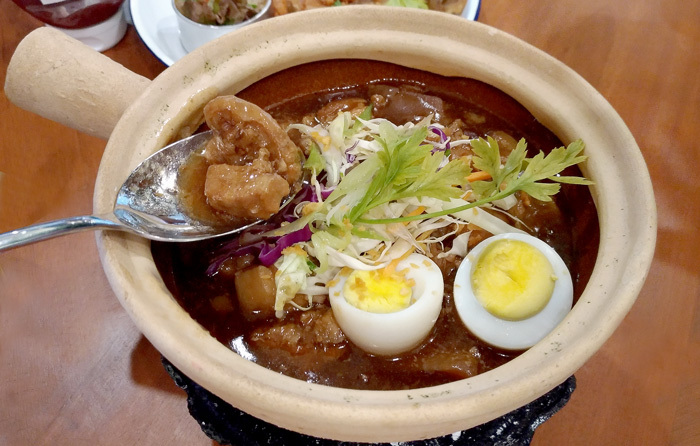 This hotpot serves 3-5 persons for PhP320. Another uniquely Sundays is the Pochero Steak. On the tray is roasted bulalo with cream sauce and cauliflower-truffle mash. 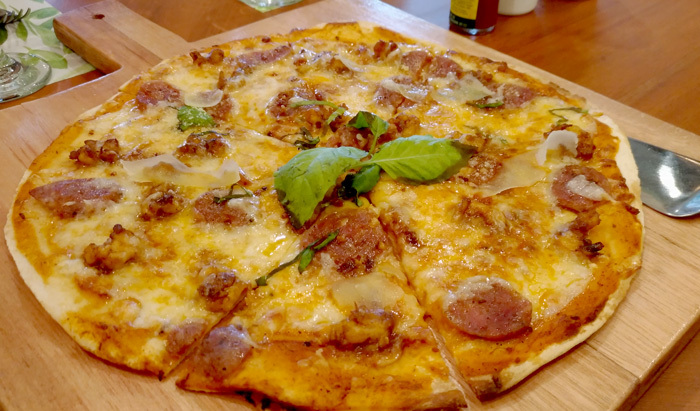 This also serves 3-5 persons for PhP480. #TeamDDI with Davao Media and Ms. Len Uy-Bosquit. Thank you for inviting us! 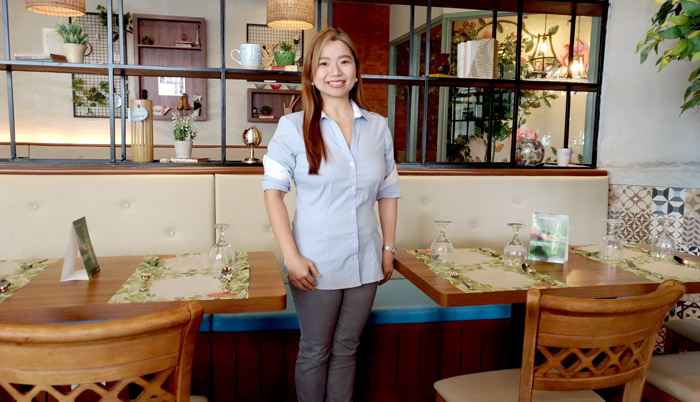 Sundays is a homey, friendly and cosy comfort food haven that offers Dabawenyos uncomplicated, fresh, healthy and easy on the pocket delectable food selections. Sundays is also where the old, simple and familiar flavours of home get a fresh, modern and sophisticated culinary flair. Bring the whole family to Sundays and make everyday a Sunday!